Dr. Byrd attended Florida International University in Miami, FL where he conducted genetic research and plant physiology research. He graduated with Honors, receiving a Bachelor of Science degree in Biology. He then received his Medical Degree from the University of Alabama at Birmingham School of Medicine and, while there, was the recipient of the prestigious William L. McKnight Award for Scholastic Achievement. After medical school, his medical internship and residency was at Norwalk Hospital, Yale University School of Medicine. He completed a fellowship in Gastroenterology and Nutrition at Yale University in 1995. During this time, he published several articles in medical journals, conducted clinical research and participated in training other physicians. He received Board Certification in Internal Medicine in 1995 and Board Certification in Gastroenterology in 1997. Dr. Byrd has been in private practice as a sub-specialist in Gastroenterology since 1995. He has continued to assist in conducting clinical research studies and has served on numerous boards and committees in an effort to improve and advance health care. He serves as president of Southern Gastroenterology Associates and is medical director of CCHC Endoscopy Center. 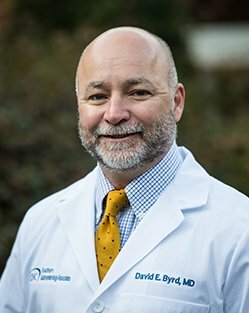 Dr. Byrd’s special clinical interests are in cancer prevention, fitness, and nutrition. He and his wife are avid boaters and have made New Bern their home since 1997.